The LearningMethods office is located on the corner of Tilden Crescent and Kingdom Street (entrance is on Kingdom Street). We are just east of Scarlett Road, north of Eglinton Avenue and south of Lawrence Avenue — a 10 minute walk fro the Weston Go train, or a 20 minute bus trip (#79 or #79B bus) from Runnymede Subway Station on the Bloor line. 4. 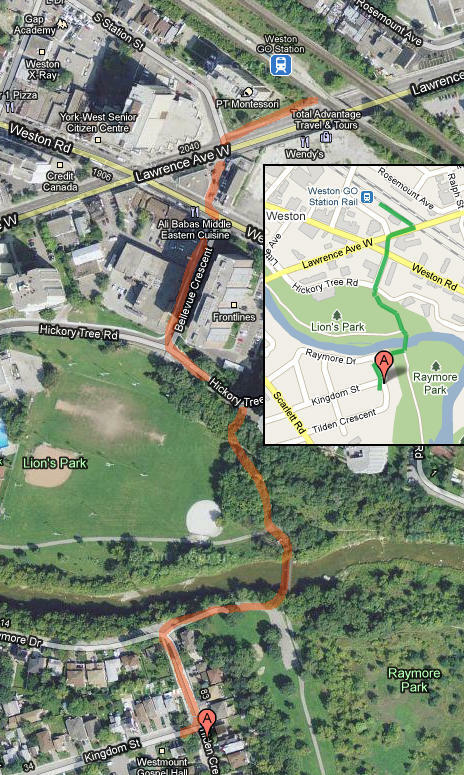 If you are walking from the Weston GO train station, use this map below. 1. Static map for trips by Subway/Bus or by Car: If you are driving, we are just to the east of Scarlett Road 2 blocks south of Lawrence on the corner of Tilden Crescent and Kingdom Street (entrance is on Kingdom Street). 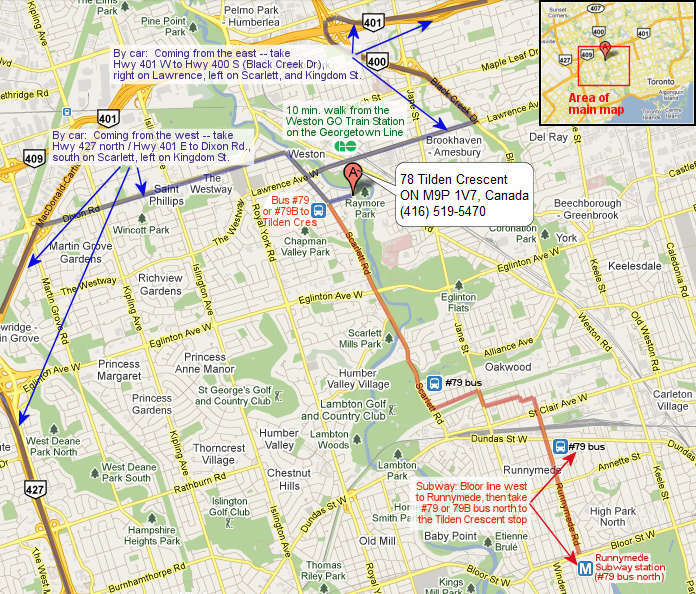 The #79 bus or #79B bus comes north from Runnymede Subway. 2. Live Google Map below with exact location of the LearningMethods office (red marker). SWITCH VIEWS in upper right - hybrid view will show best view of building. 3. Get Personalized Directions: Get written directions along with a driving map from your place to the LearningMethods location. Just enter your postal code (or US zip code) below (or a full address, e.g. 27 Main Street, Anyville, ON, L2R 3H7) and press "Go"
4. Static map to walk from Weston Go Station to 78 Tilden Crescent: Satellite map below shows route from GO station (inset on the right shows same route on a map). Leave the GO station from the south entrance on Lawrence Road, cut through to the left opposite S. Station Street (or walk to Weston Road and turn left). Walk down Bellevue Crescent and cross Hickory Tree Rd. Take stairs down into Lions Park and follow path towards bridge. Cross bridge into Raymore Park and immediately turn right up the entrance road. Turn left onto Tilden Crescent and walk one block to Kingdom Street - we are on the corner.